Unlike humans, who inevitably suffer the passage of time, abandoned buildings, though worn down and weary, can still look like they’ve outwitted the process of decay, often standing as a majestic memento mori held in the arms of nature. There’s a peculiar charm about a place that was once party to the ebb and flow of life. Lavishly decorated walls slowly fall into ruin while once-decked chambers host infestations, and dirt and dust now cover crystal windows that in times past were perfectly clear. Formerly flowing fountains are now dry and covered in withered ivy. There are many buildings around the world that would fit this narrative, but perhaps one of the most intriguing stories is that of the elegant Renaissance palace Pidhirtsi Castle in the village of Pidhirti in Ukraine. 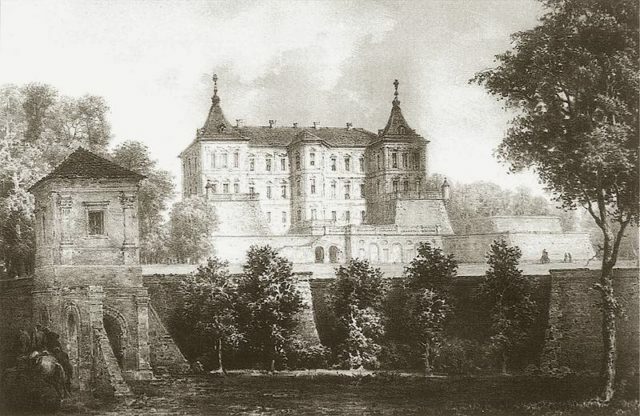 This well-preserved castle was built at the request of Crown Hetman Stanisław Koniecpolski by the architect Andrea del Agua, with the support of engineer Guillaume Le Vasseur de Beauplan, between 1635 and 1640. Unlike other castle constructions in the region, which were built for military purposes, this one was initially built for leisure–a notion that is accentuated by its Italianate gardens and the two churches on the grounds, leaving the impression of a palace or a country house rather than a military castle. 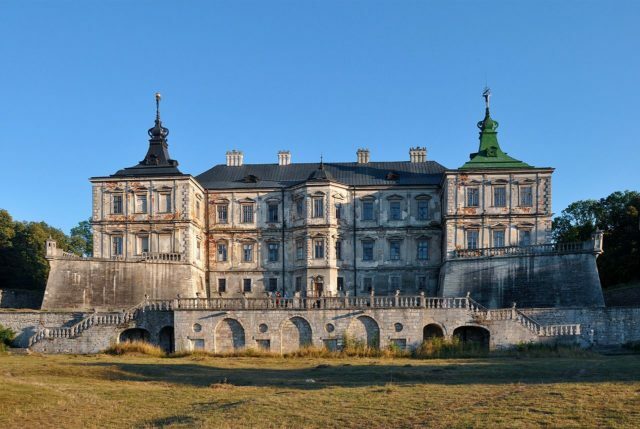 The castle’s shape is square, surrounded by a moat and defensive reinforcements on each side, while in its center stands the breathtaking palace that is the oldest in Ukraine and Eastern Europe. Its interior was created in a Western European style, which is reflected in the names of its many halls, such as Green, Crimson, Knightly, Mirrored, and Golden–all a reference to the valuable Turkish cloth that covered the walls and the furniture. Napoleon Orda, Castle in Pidhirtsi. Its 18th-century owner, Waclaw Rzewuski, was a diligent collector who opened a theater in the castle and, moreover, gathered a precious collection of books, weapons, and paintings of Polish King Jan III Sobieski. 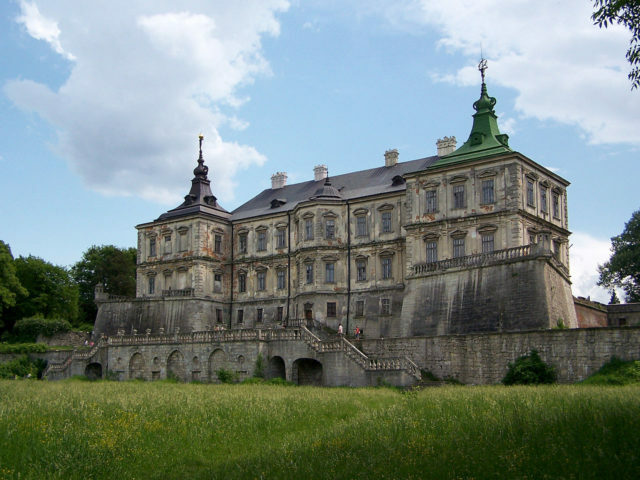 The castle contained a massive library and archives and was the first palace museum in Ukraine during the 18th century. 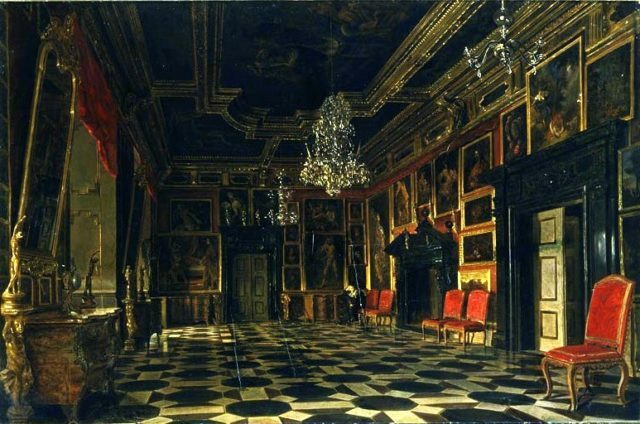 The Crimson Room (1871), painting by Aleksander Gryglewski. Over time, the castle went through many renovations, suffering severe damage on several occasions. Initially, it was badly damaged during the Polish-Soviet War in the 20th century, hence its misfortunes continued in the aftermath of WWII. It was then that the castle was converted into a sanatorium for patients suffering from tuberculosis. Another major damaging event occurred in 1956, when the site was hit by a lightning storm that started a fire. It was frequently abandoned or misused during the Soviet era. All these calamitous events caused a decline in the east and west wings of the palace, with the decay of its walls and flooding in the courtyard and the park. At the beginning of the 20th century, the owners restored the palace and opened a museum in it. Decades later, the Lviv Historical Museum took over the castle but found many art relics had been destroyed by the Soviet military. Finally, in 1997, the site was handed to the Lviv Art Gallery and supported by the charitable foundation of Borys Viznytsky. The foundation aims to find art patrons or investors who can help with the restoration of the site. Today, the restoration is carried on by the students of the Lviv Polytechnic University and the students of Vienna Polytechnic who performed the first architectural survey of the palace. Using contemporary and professional equipment, these enthusiasts are trying hard to reinstate the original look of the castle.